More examples/demonstlations available at YouTube. 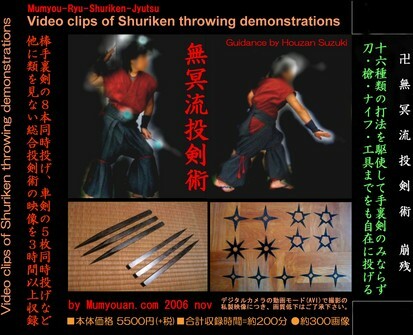 This DVD disc contains huge collection of amazing varieties of shuriken throwing art never seen in any other Videos/DVDs. It shows many techniques for the first time. Sticking eight bo-shurikens thrown together from the distance of 7.2 meters (24 feet). Throwing wakizashi (short Japaneses sword) and hidden sword. Throwing small spare and knife throwing. Sticking shuriken on the cement brick. 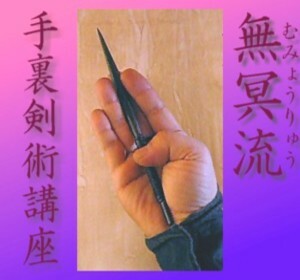 For those who actually want to learn and for simple shuriken enthusiast, it's a "historical recording" without exaggeration. It explains 16 different basic throwing methods in detail, as well. With the "Middle grade Shuriken throwing course" book, you can learn the secret art of shuriken throwing from the beginning to very advanced level by yourself. As the movies were taken with digital home video, the quality of images aren't perfect. The DVD contains avi movie files you can view with MediaPlayers and other movie viewer on your PC. This disc is available at $40 USD + shipping. This disc shows basic skills needed for throwing bo-shurikens or knives with "no-spin (quarter spin) method". English explanations for this disc are available in YouTube. This book explains how to throw bo-shurikens or knives with "no-spin (quarter spin) method". 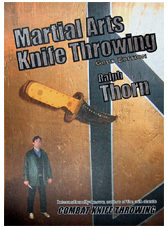 It's mainly written for those who have already some experiences with shuriken/knife throwing. Third edition has 130 additional pages, and it's dedicated to all shuriken/knife throwers of the world who love no-spin (quarter-spin) method. If you can read Japases, please take a look at this book.